The very same Museum of Fine Arts (MFA) gallery that hosted Takashi Murakami’s “Superflat” monsters and 19th century Japanese paintings last year is now, as the site for the exhibition “Ansel Adams in Our Time,” temporarily home to the transcendentalist photographs of Ansel Adams (1902–1984) and those who came before and after him. Once again, the MFA weaves through different time periods with a common thread, visualizing the evolution of generational experiences. Ansel Adams was an American photographer and environmentalist. Born and raised in San Francisco, Calif., Adams had his nose broken from an earthquake in 1906 and carried this facial distinction with him for the rest of his life. His peculiar appearance, coupled with his natural shyness and background as an only child, made it difficult for Adams to blend in at school. For Adams, this solitude translated into a love for nature. From taking walks amidst the dunes near the Golden Gate as a child to repeatedly returning to Yosemite National Park as a professional photographer later in life, Adams stayed invested in a longing for the sublime. Taking the awe-inspiring scale of nature out of its organic context, Ansel Adams idealizes the American landscape as a piece of “tamed wilderness.” Adams’ monochromatic, first fully visualized photograph “Monolith, The Face of Half Dome” (Yosemite National Park, 1927) combines the splendid vision of nature that refers to the mid-19th century Hudson River School of painting and the minimalist aesthetic of the late 20th century postmodernism. The photo displays a magnificent view of the well-known Half Dome at Yosemite National Park. The singular protagonist in the composition — the lofty Half Dome — overwhelms more than half of the featured scenery like a black, viscous waterfall. And like early Romantic paintings, Adams’ photo excludes all human intrusions into pristine nature. That being said, Adams’ photo does not reflect the most genuine love of the wilderness, because it strips the wilderness of its dynamism, dirt, mortality and, essentially, life. Like the metaphoric title that compares the Half Dome to a “monolith,” Adams’ photo upholds a strong tastes for minimalism and industrial precision. The composition is divided into five arguably irregular shapes, including the Half Dome, by fine, sharp outlines. Each form is simplified; the natural granite corrugations on the Half Dome are barely visible; the night sky is unspoiled by clouds or stars; and the earth, despite being dotted by several tall pine trees, is mostly buried under unvaryingly white snow. The solemn and cold air that Adams’ photo emits anticipates the clean but abstinent aesthetic in later sci-fi films such as “2001: A Space Odyssey“ (1968) and minimalist artworks like the untitled stacks of metal rectangles that Donald Judd made since the late 1960s. However, true wilderness is the antithesis to stillness and tidiness. Rather, it is filled with bugs, mud, animals, heat, colors, sweat and blood; it is a dynamic ecosystem of consumption, of both beauty and horror. Adams’ photo celebrates the grandeur of nature at the expense of also reflecting its lively, sometimes even disgusting aspects; thus, the photo situates itself comfortably within the not-unchallengeable confines of its medium, as a piece of safe and entertaining spectacle of gallery art that is nevertheless unrealistic. Unlike Adams, some American photographers after him see nature as much less majestic and are hence willing to playfully marry it to the human world. The collaborated photo collage (2003) by Mark C. Klett and Byron Wolfe sings a harmonious symphony of people and nature. With rugged top and bottom sides and missing content from the discontinuous scenery it depicts, the photo collage resembles an arguably failed panorama taken with a shaky hand. Inserted into a section of the “failed panorama” is another photo that depicts the same section of a different time, which appears obviously different in tone than the rest of the panorama. This overall amateur-looking structure of the collage diverges from Adams’ humble admiration towards nature because, instead of leaving nature ‘untainted,’ Klett and Wolfe symbolically assert human agency over nature by deleting parts of it and adding new parts to it, like tailors mending a cloth. The magnificence of nature is also downplayed in the photo collage due to the lack of a singularly dominant subject, like the Half Dome in Adams’ photo mentioned above, in the composition. Rather, the panorama borrows the multi-foci structure from impressionist paintings. The composition depicts nature and people in various forms across the panorama, with the former manifested as trees, mountains, rivers and earth, and the latter doing different activities like boating, walking, and sitting. The lack of an obvious foci of the photo collage thus does not give nature the same overwhelming power over humans as Adams’ photo does. Arguably a modern, photographic parody of George Seurat’s famous neo-impressionist painting “A Sunday Afternoon on the Island of La Grande Jatte” (1884) to certain extent, Klett and Wolfe’s work endorses the post-industrial theory that the urban life is a part of nature. The interpretation for the ideal dynamic between people and the wilderness has been changing for centuries and probably will become increasingly debated in the years to come, especially given the rising antagonism between industrial development and environmental protection. Any theory that favors the prosperity of one based on the destruction of the other could lead to the end of human civilization — our future must fall in between. 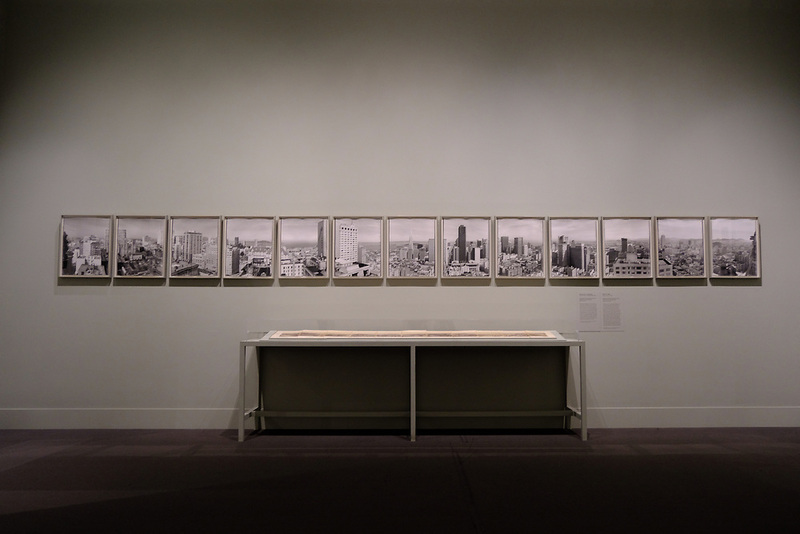 “Ansel Adams in Our Time” will remain open until Feb. 24. All Tufts students can visit it for free with valid Tufts IDs. Ansel Adam's solo exhibition at the MFA is just as sublime as the nature he depicts.